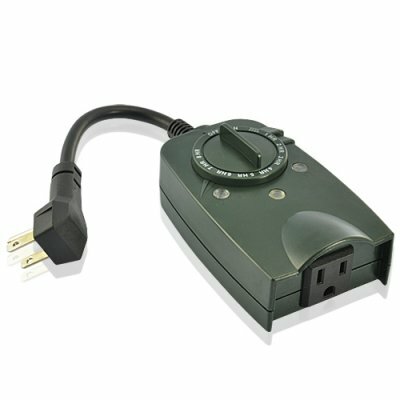 Successfully Added Weatherproof Outdoor Photocell Timer with Single Grounded Outlet (US) to your Shopping Cart. This convenient and easy to use Weatherproof Outdoor Photocell Timer automatically turns on and off your lights just at the time you need it and helps you drastically cut energy costs. Great for outdoor lighting needs, this Weatherproof Outdoor Photocell Timer comes with a sensor that can both increase and reduce the current flowing through the power outlet, offering you a variety of options in controlling your lights. You can also set a timer to your lights with options including always on, on from dusk to dawn, or on from 1 to 8 hours. Simply plug your light in the outlet and set the timer, your light will then be turned on and off accordingly. Better yet, this Outdoor Photocell Timer is completely weatherproof, meaning you can leave it outdoor all year round, whether it’s rain or shine. This handy and useful gadget is now in stock for immediate shipment worldwide and is offered at a direct-from-factory wholesale price. Suitable for both personal use and resale. Order yours today and it will get shipped within a day. From the leader in high quality low price electronics, Chinavasion. Great for year round use. When used outdoors, this timer must be plugged into a GFCI protected outlet to prevent shock hazard. Hang the switch downward so moisture does not accumulate in the outlet. Install cord and unit above ground level with the receptacle in downward position and at least 1.5m above ground. Suitable for damp locations. NOT for water immersion or for use which directly exposes the outlet to water. When not in use, it’s recommended to store indoors. Do not splice, repair or modify. Unplug when not in sue. Fully insert the plug.